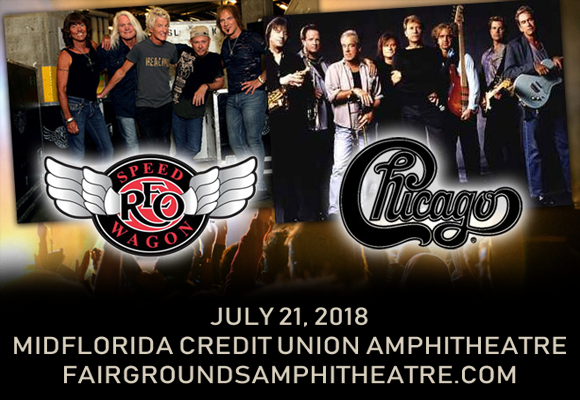 It's one hell of a rock and roll party as Chicago & REO Speedwagon team up for an unforgettable co-headlining tour, coming to MidFlorida Credit Union Amphitheatre on Saturday 21st July 2018! Best known for their number-one hit singles "Keep On Loving You", "Take It on the Run", and "Can't Fight This Feeling", American rock band REO Speedwagon formed in Champaign, Illinois in 1967. Signing to Epic Records in 1971, the band released a steady stream of successful albums throughout the 1970s, including their biggest success, 1980's Hi Fidelity, which has sold over ten million copies and launched four US Top 40 hit singles. To date, REO Speedwagon has sold more than 40 million records and has charted thirteen Top 40 hits.